Despite the fact that this city is home to Annihilator—one of the most promising young bands in metal—Vancouver has yet to prove itself as a world-class heavy metal town. Aside from Annihilator, there hasn’t been a successful metal recording act out of this city since Kick Axe set up shop here in ’83 and went gold with its debut album, Vices. But that fact didn’t stop Annihilator guitarist/songwriter Jeff Waters from moving here from Ottawa in ’87 and giving it his best shot. “In Ottawa and Vancouver, as I found out when I came out, there wasn’t much of a metal scene happening and a lot of heavy-metal musicians, compared to other places in the world,” says Waters. “But when I came out to Vancouver my goal was to build a band around me of guys that were not just into the thrash-metal scene like a lot of musicians in New York and San Francisco are, I wanted guys that that could do different stuff—like anywhere from Queen to Saga to Rush to Aerosmith. You know–versatile musicians, that’s what I’m tryin’ to spit out. And I found them easily, because there’s so many bar bands in Vancouver with musicians that have the potential—but they’re playing cover tunes. They have that mentality where they think that’s gonna make them famous and they’ll be discovered or something. 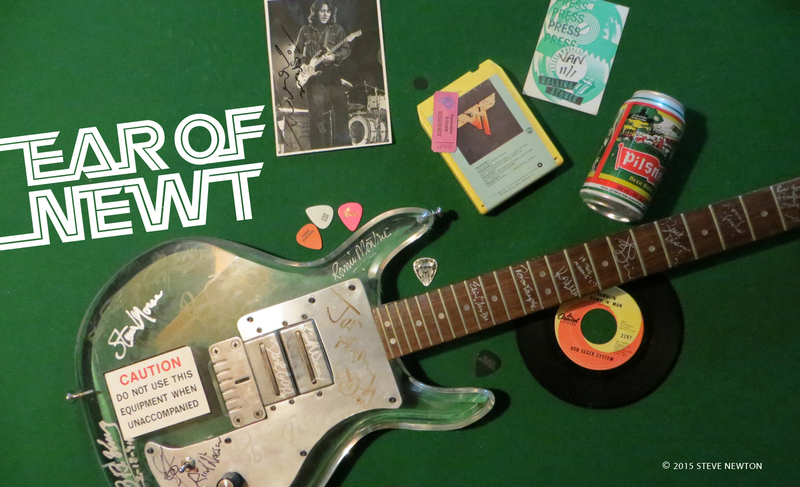 Waters’ enthusiasm for the talents of his hand-picked band-mates—and their resulting metal noise—is not without its backers. Across the Atlantic, Annihilator is one of the hottest metal acts around; they consistently tear up the charts in the European metal fanzines. Britain’s heavy metal bible, Kerrang!, recently gave the band’s new album, Never, Neverland, a four-K review (five is tops), and proclaimed that Annihilator “will become one of the biggest thrash groups in the world”. And the band is still numb from the terrific reaction it got during its second European tour earlier this year. Currently on a whirlwind U.S. tour, Waters called the Georgia Straight last week from New Orleans, during a stopover between gigs in Texas and Florida. He explained how, after a couple of years of classical and jazz lessons, he picked up the rock bug from bands like Iron Maiden, Judas Priest, Kiss, Aerosmith, and Sweet. 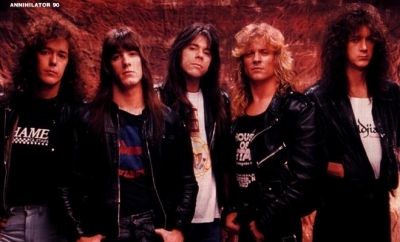 Annihilator’s move to more of a melodic hard-rock sound is subtly evident on the new album, although the group still retains the thrashy edge so prominent on its debut Alice in Hell album of 1988. Never, Neverland is the first Annihilator record to feature former Omen vocalist Coburn Pharr, who replaced one-time D.O.A. member Randy Rampage last year. The new LP—which Kerrang! describes as “a real chest-burster of an album”—was recorded at Vancouver Studios, and co-produced by Waters and Glen Robinson, whose previous engineering credits include Voivod, the Cult, and Queensryche. As a matter of fact, Annihilator shared the Vancouver Studio facilities with Seattle hard-rock kings Queensryche while the latter was making its current album, the chart-busting Empire. “We had some vicious pool tournaments with those guys,” says Waters, adding that—while local studios like Mushroom and Little Mountain have higher profiles—Vancouver Studios proved ideal for his band. He says he’d like to make the next Annihilator album there as well.